I'm not an Obama lover or hater. I've grown weary of politics. I thought the "Beer Summit" they had seemed fake and just a photo op. But Obama is turning me. I am a home brewer. Many presidents in the past were brewers. 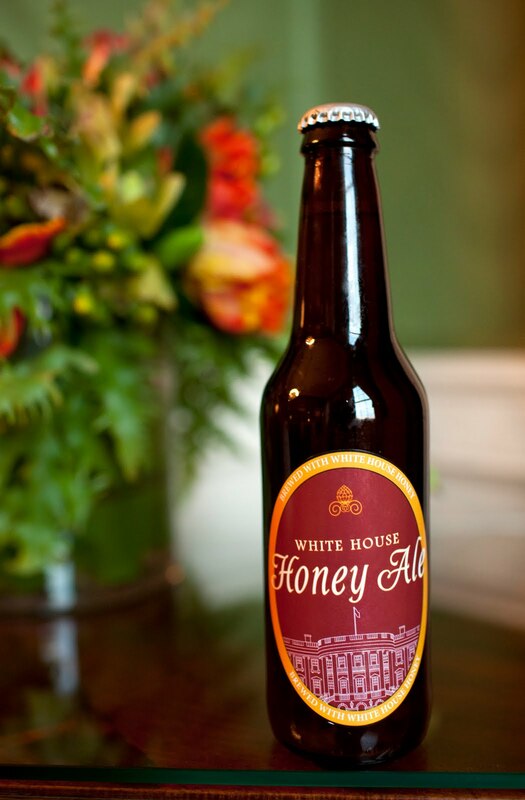 I did the fact that he bought a beer kit and had a White House Honey Ale using honey from the bee's around the White House. Now I just wonder what equipment the president of the United States uses. Buckets? Better Bottle? Temp Controlled MoreBeer.com fermentors? I love this sort of stuff and the same seems to happen in every society. That people seem to care about the tastes of prominent people. Here in the UK you can guarantee any product mentioned relating to the Royal wedding will get a boost in sales, and people actually seem to care that the British Prime Minister likes a Guinness. Previous German Chancellors got a poll boost if they appeared drinking a beer, and a previous Australian Prime Minister gained a lot of kudos for the fact he beat the British at “skulling” beer when studying in England and held a world record for it. Does it matter what Obama likes to neck? Whether he likes a wine or beer, he’s free to like what he likes and enjoy whatever he fancies (well, apart from interns). It really doesn’t say anything about him, does it? Does it matter? This only matters to me because it's a chance to get up the nose of the wine snoots! Does it say anything about him? Yeah, it says he likes beer...and that's all. Yup. i have a sinking feeling ( and this is not singling out President Obama, but rather modern business of American politics as a whole)that if appealing to a certain demographic was required for re-election, the white house lawn would be plowed and planted with grape vines in order to produce wine just as quickly as the presidents multimillion dollar marketing operation puts that beer story on the wire. Whether or not the president likes beer has absolutely nothing to do with his image projected by his marketing team. There is too much money involved for politicians to act like themselves. Every single action, photo, comment is a marketing opportunity that is exploited to its fullest extent. Does he like beer more than wine ? maybe why not. But this press relaease has nothing to do with what the president likes or prefers. Wow, Al, you're even more cynical than Uncle Jack. You really think that Obama or his handlers believe he's going to get any significant political advantage out of having a single batch of beer homebrewed at the White House? Please elaborate! Maybe he's sophisticated enough to enjoy both beer and wine. Perhaps also a glass of spirits or even -- gasp! -- a cocktail now and then! Really, Lew, you should know better than to play this game. The idea that anyone, however prominent or not, should be a "wine guy" or a "beer guy" is just the sort of polarization that MJ used to make a mockery of, and which I still rail against at every opportunity. Would you try to change the mind of someone who said they only like lagers and won't touch anything top-fermented? Of course you would, and it is no different if that person said they liked only beer and never wine, or wine and never beer. One of Micheal's great quotes: "People ask me if I also drink wine, as if beer was a prison rather than a playground." Only reason I do it: because winefolk keep trying to shove him into that hole. You know anyone in the WH that could score a few bloggers a bottle? I would absolutely love to try this and see how well it worked. What do you think, Lew, do we have any weight to pull? As for the politics, I think there clearly aren't any at play. Sometimes a homebrew is just a homebrew. However, as an erstwhile politics writer, I could make the case that this isn't exactly a bad way to appeal to the electorate. Far more people drink beer than wine, and more importantly, far more men--who tilt to the red team. Obama already has all the wine-drinkers. From the perspective of optics, this works to his advantage. But since the WH hasn't even bothered to comment on it publicly, I think we can infer that it's not a major initiative in his re-election effort. You had to go to the lame "elitist" place? Come on Lew, you're better than that. Tom, TIC, not that it matters at this point.